Golkar’s Paskah Suzetta is accused of corruption and bribery to favour the re-election of Miranda Gultom as deputy chief of Indonesia’s central bank. Many lawmakers are involved in the scandal. Ms Gultom has not yet been charged but it is believed that she provided the money needed to “buy” her appointment. Jakarta (AsiaNews) – The Indonesian Corruption Eradication Commission (KPK) has added former National Planning Board Minister Paskah Suzetta (pictured) on its list of suspects after charges were laid against him for corruption and bribery. The affair is bound to widen since former Indonesian Central Bank Deputy Governor Miranda Gultom and the wife of former Indonesian Police Deputy Chief, Nunun Nurbaeti Daradjatun, also appear to be involved in the scandal. Ms Gultom’s re-election in 2004 was apparently made possible by bribes and a flow of cash into the pockets of many lawmakers. Mr Suzetta, a senior politician with the Golkar Party, is among 25 high profile suspects involved in the KPK investigation, which touches dozens of lawmakers and top political leaders. Wednesday night, KPK deputy chief M. Jassin outlined the latest developments in the anti-corruption investigation, causing uproar and controversy in public opinion. 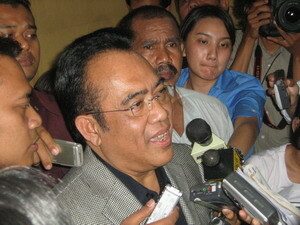 Agus Condro Prayitno, an ex-politician with former President Megawati’s PDIP party, made the revelations about the kickback scheme that could lead to Miranda Gultom’s downfall. He said that he and dozens of other lawmakers received billions of rupiahs to guarantee Ms Gultom’s re-election as deputy governor of the Bank of Indonesia, Indonesia’s central bank, in 2004. Her bid for a second term was in fact successful. Agus Condro, who is also suspected for corruption, said he decided to disclose the facts to clear his conscience, stating that he had returned the money gained unlawfully. According to Bibit Samad Riyanto, another KPK deputy chief, some members of parliament got more than 1.45 billion rupiahs (US$ 160,000) for supporting Miranda Gultom. Altogether, 51 lawmakers from the Ninth Commission of the House of Representatives (People's Representative Council), which oversees banking affairs, are accused of corruption. In exchange for a favourable vote, the politicians received money from Nunun Nurbaeti Daradjatun, a broker close to the former deputy chief of the Bank of Indonesia. Ms Nunun, the wife of former Deputy Police Chief Adang Daradjatun and current Member of Parliament for the pro-Islamic PKS party, is in Singapore at present for health reasons. She is believed to have channelled a total of 24 billion rupiahs into the pockets of members of parliament. Indonesian public opinion has welcomed the latest developments in the anti-corruption probe. Graft and corruption are endemic in Indonesia, and President Susilo Bambang Yudhoyono made them a key part in his re-election campaign. Still, despite suspicions over her role in paying out kickbacks, Miranda Gultom has yet to be officially charged.